Photo via Times of Israel // Knesset election ballots at a polling station in Jerusalem, January 22, 2013. 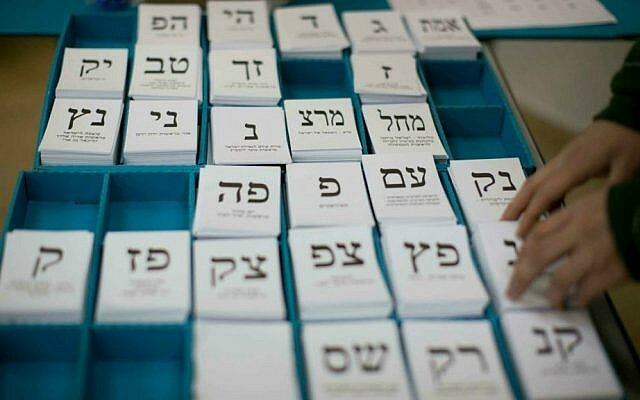 On Tuesday, after displaying a national identity card, an Israeli voter will enter a screened booth and find a tray containing slips of paper with large block Hebrew letters and, in smaller print, the names of political parties those letters represent. As this article was written, there were 42 parties vying for seats in the 120-seat Knesset, down from the 47 certified by Israel’s Central Elections Committee. That means slips of paper for 42 parties. Trays were constructed to accommodate slips of paper representing that record number of parties. There are 22 letters in the Hebrew alphabet. Thus the need for multi-letter combinations. Some older parties, such as Likud and Labor, have used the same three-letter combinations in past elections. Newer parties pick combinations not in use. The voter will take a slip of paper representing the party of their choice, place it in a blue envelope, then place the envelope in a ballot box. That’s it. No computer touchscreen. No key card. Just several million slips of paper to be counted by hand. 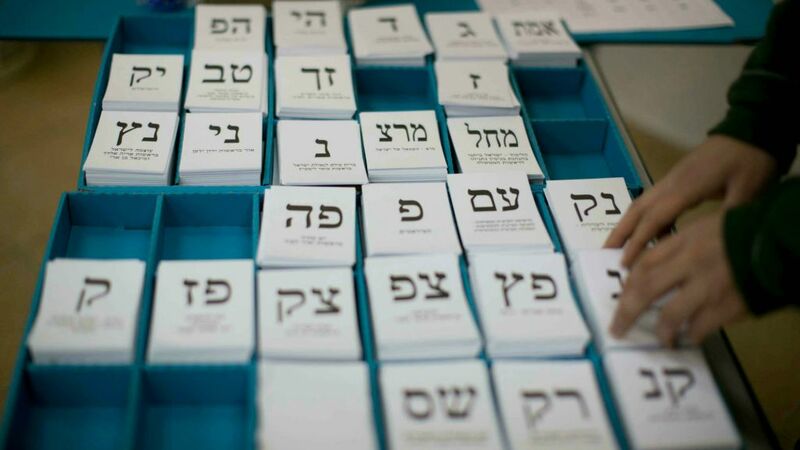 The Times of Israel reported that to cover every possible vote by 6,339,279 eligible voters, at 10,720 polling stations, election officials printed 400 million slips of paper—enough for every vote, plus extras. Polls open at 7 a.m. and close at 10 p.m. Israel time, after which time exit polling data will be released. Unofficial results will follow overnight and be certified eight days later. Each party previously released its list of candidates in order of their priority to fill Knesset seats, depending on how many the party wins. To be represented in the Knesset, a party must receive at least 3.25 percent of the vote, which translates to about three or four seats. Of those 42 parties, maybe a dozen or so will meet the threshold. To form a government, Israeli President Reuven Rivlin will turn to the leader of the party viewed as having the best chance of putting together a majority bloc in the Knesset. No individual party has ever won a majority in the Knesset, so smaller parties have the leverage to set their price – such as control of a ministry or money for their programs – for joining a governing coalition. The head of the party that cobbles together a majority bloc in the Knesset becomes prime minister. In 2015, that again was Prime Minister Benjamin Netanyahu, whose Likud party received votes that translated into 30 seats, and then brought in smaller parties to form a parliamentary majority. If he and Likud are successful again, Netanyahu in July will become Israel’s longest-serving prime minister, surpassing the first prime minister, David Ben-Gurion. Once approved by the new Knesset, the prime minister and the new government are sworn into office. That is set to happen April 23. The leader of the party asked to form a government has 28 days – plus 14 more if requested – to accomplish that task. If that first effort fails, the president turns to another candidate, who has 28 days to accomplish that task. Should that fail, a majority of the Knesset could ask the president to assign the task to another Knesset member. This has never happened. Unlike Americans, who can vote abroad, Israelis must be in Israel to vote. The only exceptions are Israelis on official business abroad, such as members of the diplomatic corps, who voted March 29 at Israeli embassies and consulates. Israel’s Central Bureau of Statistics says that 91 percent of eligible voters reside in Israel. There are some 500,000 (give or take 200,000) Israelis living in the United States, including an estimated 12,000 to 15,000 in Atlanta, along with Americans who have made aliyah and also have Israeli citizenship. To entice voters home, El Al offered special fares in the days before the election; $799 round trip from New York, for example. While Americans and Israelis both talk a lot about politics, a higher percentage of Israelis back up their words by voting. A lackluster 58 percent of eligible Americans voted in the 2016 presidential election, compared with 72 percent of Israelis in their 2015 national election. As in America, the voting age in Israel is 18. Arab citizens, who make up nearly 21 percent of Israel’s population, have voting rights, along with the nearly 75 percent who are Jewish, and 4 percent of “other” identification. Unlike America, Election Day in Israel is a national holiday. The word “knesset” comes from the “Knesset HaGedolah” or the “Great Assembly,” a group of 120 Jewish sages and prophets formed in the fifth century B.C.E. Among those on the ballot in the 21st century C.E., is the Pirate party, whose leader is listed as – yes – the internet. But no pirates are expected to win seats in the Knesset.